When Audi debuted the new five-cylinder RS3 hatchback, we had but one question: “When’s it coming to America?” And Audi said it more than likely would, just not in hatchback form, because us Americans just don’t buy those fancy luxury hatches the Europeans love. 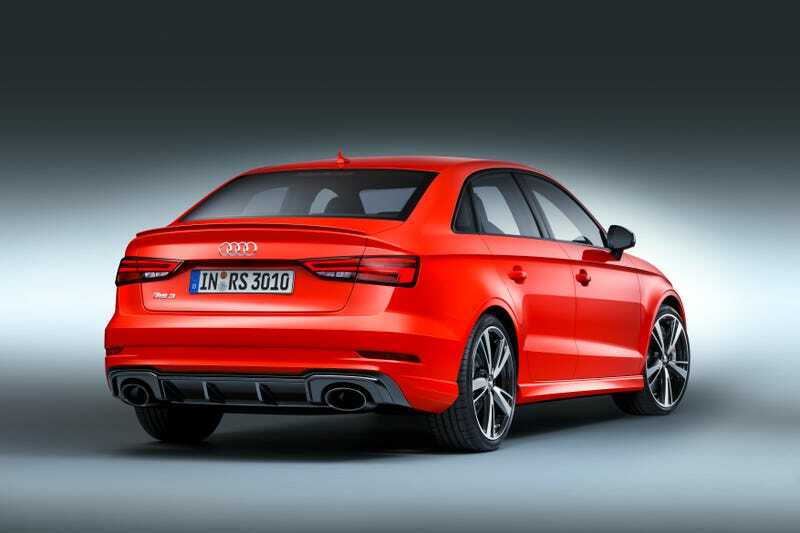 Here’s the one we are getting, for sure and officially: the RS3 Sedan. And Audi said that unlike the current RS3 hatchback, this one has had its 2.5-liter five-cylinder turbo engine bumped to 400 horsepower, making it the most powerful production five-cylinder in the world. It also comes with 354 lb-ft of torque. That’s a big bump from the existing S3 sedan—a very good car, by the way—rated at 292 HP. Five cylinders! Better than four, more interesting than six. Audi says the RS3 sedan will do zero to 60 mph in just 4.1 seconds. The sole gearbox choice is a seven-speed dual-clutch with paddles, making for a faster and better pick than even a Golf R. And of course, power goes to all four wheels. No word yet on pricing, but we can expect it to compete with the BMW M2, so I’m expecting the low-$50,000 range or so, probably without too many options. It comes to the U.S. and China next summer.